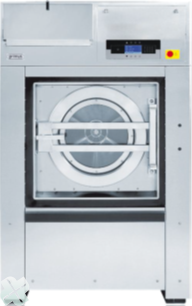 The seed rinsing machine is based on professional or industrial washing machines from the leading brands. These machines are converted, so they will comply with the specifications to be able to professionally clean and treat the seed. On the touchscreen the operator can select the desired recipe or chose an existing recipe. Depending on the user intensity and batch size, the type of machine (professional or industrial) and the capacity (7-180 KG) are selected for you. On the left a Primus washing machine which is used for the professional market. Converted to a seed rinsing machine. The drum, tub and the complete encasing are made from stainless steel. The inside drum is equipped with ribs, which ensures a better mechanical operation. The drum is driven by a frequency-controlled engine. The water is heated by means of electric heating elements. A temperature sensor registers the water temperature. A flow meter ensures the exact desired quantity of water will be added. Water pressure sensors ensure the water remains at the desired level. The machine is equipped with three water connections, through which the machine can be filled with cold or warm water, or a mixture of both. – Option for desired chemicals; standard option is 4 chemicals. – Setting of the quantity of water needed to rins the supply pipe of the chemicals. This water will go to the drum and will be deducted of the total desired quantity of water. – Option to discharge water to collecting tank of the sewer. – Maximum water level before centrifugal stage can start. The rinsing machine is filled with bags of seed. The desired recipe is chosen. After setting the weight of the batch, it will be known how much water has to be dosed. The rinsing stage is started, followed by the treatment stage. After every rinsing and treatment stage and before every centrifugal stage, there is always a drainage stage. During the treatment stage with chemicals, a part of the desired water quantity is added. Afterwards the correct quantity of chemicals is added, followed by the rinsing water. After adding the rinsing water, additional water can be added to achieve the total desired water quantity. The standard control is able to suction 4 different chemicals. The drum has a cycle of (short) rotation and (long) pauses. The rotation direction can be alternated automatically. The maximum treatment time is configured to 24 hours. After the treatment, the water is discharged to a collecting tank or to the sewer. The bags of seed are centrifuged to discharge the adherent water. The door can only be opened when the program has been completed entirely. As the seed has been centrifuged, the treated seed can be dried immediately after the treatment. 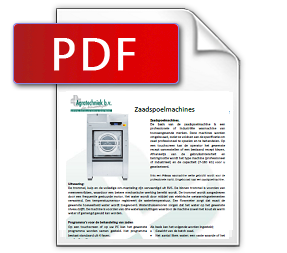 Agratechniek has different possibilities: Among other things, a fluid tray dryer for 20-100 KG. Dosing installation with 2 flow meters and the 2 frequency-controlled pumps for the chemicals. The basis of the rinsing machines consists of the brands Primus and Milnor. These are sold worldwide, so maintenance and service to the machine is possible in every country. 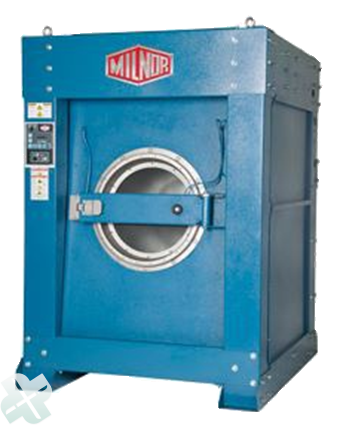 A the right a Milnor washing machine which is used in the industrial market. This one is also converted to a seed rinsing machine.